WEST LAFAYETTE, Ind. — Even more children will benefit from Purdue University’s award-winning Purdue Athletes Life Success Program this summer as the camp, its activities and its support keeps growing. More than 400 children will attend the June 18 through July 17 program also known as PALS. Last year more than 350 children attended, and this year’s program has a waiting list. The camp, for children 8-14, is free for the participants, who are selected based on referrals from local schools. “This program began seven years ago as a way to encourage children to embrace a healthy lifestyle through sports and athletics, but now it is about much more,” says Bill Harper, camp director and professor and head of the Department of Health and Kinesiology. “Fitness is still the foundation of our program, and that’s why we space activity stations apart so campers are guaranteed 70 minutes of walking a day, and this year we will be using pedometers as well. But we also want these youngsters to be successful in all areas of life, so we offer a range of activities including units on computers, stress management, nutrition and financial literacy. We also are adding orchestra, specifically a violin unit, to this year’s program. PALS, formerly the National Youth Sports Program, changed its name last summer, thanks to support from Drew Brees’ The Brees Dream Foundation and Purdue Employees Federal Credit Union, which is known as PEFCU. 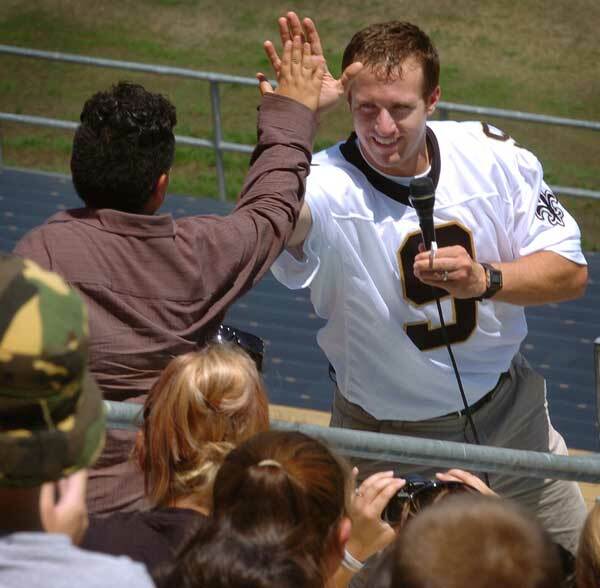 The former Boilermaker All-America quarterback, current quarterback for the New Orleans Saints and PEFCU spokesperson, has visited the camp annually since 2003. His visit to the camp this year is sponsored by PEFCU as part of its emphasis to support local youth. PEFCU also supports the camp unit on financial literacy. PEFCU employees, who work with many classrooms during the school year on financial wellness topics, teach this course. Before the name change, the national program honored Purdue’s camps for its achievements, including being named best new program in 2002 and special recognition for its 2004 and 2005 programs. This year the American Heart Association will honor Harper with the Cor Vitae Award for enhancing the community through innovation, philanthropy, vision and leadership. The National Youth Sports Program began in 1969, and in 2005 there were more than 200 programs nationwide. However, the program’s federal funding was reduced, and in 2006 Purdue’s program was one 56 in the nation to receive partial funding. Federal funding was withdrawn from all National Youth Sports Programs in 2007, but Purdue’s camp successfully continued through university and private donor support. More than 1,000 children have attended since the camp began in 2002. The students, in teams of 15, rotate through activity stations that include basketball, swimming, soccer and volleyball. The older campers get to participate in yoga, flag football, judo and table tennis. Purdue researchers in the Department of Health and Kinesiology also are studying how participation in the camp benefits children by measuring their physical fitness, academic achievement and social relationships year round. Harper says many children often lose weight during camp, and anecdotal evidence from the local schools shows that participation in the camp has a significant positive effect on education, attitudes and sportsmanship. The Department of Health and Kinesiology is housed in the College of Liberal Arts. The camp also has received assistance from Purdue’s Office of the Provost, Recreational Sports Facilities, Residence Halls, Information Technology at Purdue, Purdue University Student Health Center and the Department of Speech, Language and Hearing Sciences.